The evil truth about scrapping plans in Europe is that they are doing a great job increasing sales -- for a select few -- but even the winners are losing when it comes to the bottom line. When reporting its first-half financial results late last month, Renault said that despite the effects of scrapping schemes, Europe contributed to half of its total revenue decline. The French automaker's group revenues slid 23.7 percent to 15.99 billion euros (about $23 billion) in the period. "The product mix has been pulled downwards," Renault said in a statement. The incentives encourage people to buy smaller, cheaper, lower-margin models. That means high-margin SUVs, minivans and large cars are not moving. The automakers knew this was coming. During a chat with Ford of Europe Vice President of Sales Roelant de Waard at the Geneva auto show in March, he said he already was bracing himself for the downside to the sales surge. He was right to be nervous. Ford Europe reported a second-quarter pre-tax profit of $138 million, down from a profit of $582 million a year ago. One of the reasons Ford gave for the $444 million decline was an "unfavorable mix." 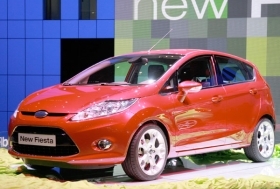 De Waards boss, Ingvar Sviggum, told Automotive News Europe last week during a conference call that one reason Ford of Europe remained in the black is because people are not downsizing on optional equipment when they downsize to Ka minicars or Fiesta subcompacts. Sviggum, Ford of Europes vice president of marketing, sales and service, said half of the Ka and Fiesta sales are mid- and high-spec versions. This definitely helps, but Ford has to sell a lot of Fiestas to match the profit it makes on a Mondeo mid-sized car or a Galaxy minivan. Sviggum said sales of bigger cars such as the Mondeo will pick up once the economy recovers and companies start to do better. Most experts dont see that happening in Europe until mid-to-late 2010. The overall recovery better start gaining traction before the incentives schemes run out of money, otherwise Europes automakers could face a repeat of the over-the-cliff sales drop seen in late-2008 and early 2009.